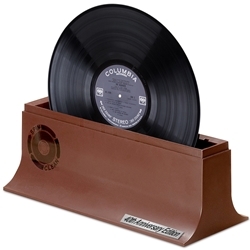 There are many ways to protect your vinyl records and make sure they play with the best possible sound quality. If you want to keep your records from warping, getting damages or getting dirty, you need to understand the best ways to protect your LPs. Here are three great ways to protect our records. It’s great to use a cleaning brush on your records, but a cleaning machine will make a huge difference. If you have over 100 records, a cleaning device will make the deep cleaning process much easier. It’s important to deep clean your records every few months to ensure they stay free of dust, dirt and oils. When you find the right cleaning machine for your records, make sure you get an approved solution made for the machine. This will ensure you don’t end up with damaged records or records not as clean as you were hoping for. Another way you can protect your vinyl records is with the proper type of handling. This starts by touching the records as little as possible with your fingers. When your fingers come in contact with the record, it transfers oils and dirt to the vinyl. You want to touch the outer edges and the label instead. Another part of handing the record properly is making sure the vinyl isn’t over exposed to the air. You want to take it right form the sleeve to the turntable without leaving it out to collect airborne dust. Of course, after cleaning and playing, you have to store your vinyl records properly or they will just get dirty and damaged. Using the proper type of sleeves, including inner sleeves and an outer jacket, will help to protect your records. Storage also includes not stacking your records and keeping them out of direct sunlight. When you stack records, it can warp them and too much heat can cause the record damage. You should always store your records vertically in an even temperature away from direct sunlight. These are just a few of the easy ways you can protect your record collection. A vinyl record cleaning machine is a great step in the right direction, but storage and handling are also very important. Make sure you address each of these areas to ensure your record collection stays in great shape. ← Why do you Need a Vinyl Record Cleaner?